Half the Size of a Traditional Elliptical! PRICE ALERT: Secret Sale on the Bowflex Max Trainer M7 only for our site visitors! Click here for $900 OFF the Max Trainer M7 with code SECRETSALE. Offer Ends Soon! BowFlex is known for its hyped up infomercials, which have been extremely successful in selling the BowFlex TreadClimber that claims to get mind blowing results in no time at all. We’re here to expose the hype from the facts. Well, the newest piece of equipment from BowFlex is the Bowflex MAX Trainer available in a M3, M6, and M8 version. Like the Bowflex TreadClimber, they claim the same amazing results within a minimal time frame. Their “research” also shows that their machines get considerably better results in comparison to treadmills and ellipticals. The main competition for these models is going to be the ProForm SMART HIIT Trainer and SMART HIIT Trainer Pro. 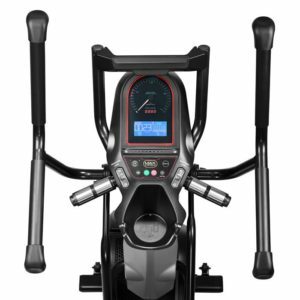 BowFlex Max Trainer Sale – The current promo code reduces The Bowflex Max Trainer M3 to around $999, the M6 to just $1,599 and the M8 to $2099. Use Code “TAX2019” for discounts on all models of the Max Trainers! 1. Three times a week for 14 minutes isn’t enough! The BowFlex MAX Trainer can give you some impressive results, but NOT miraculous results. For example, with the MAX Trainer, BowFlex claims if you use it fourteen minutes, three times a week you’ll see results. Obviously you’ll get results in comparison to laying on a couch, watching TV and eating bon-bons. However, if you want to burn serious calories and get real results you need to commit a serious amount of time. In fact, in one of the reviews a customer states that “14 minutes, three times a week is NOT going to cut it”. When you watch the videos there are numerous satisfied customers that lost considerable weight in ten weeks. We can guarantee they worked out more that 14 minutes, 3 times a week. There are also customers that have impressive pecks and six pack abs. That did NOT come from using the MAX Trainer. That is from some intense strength training and ab workouts. 2. It’s About Your Diet Too. If you want impressive results you need to do more than exercise. You’ll also need to radically change your diet and eat less. They really do not mention that in the videos. 3. The Research is Skewed. 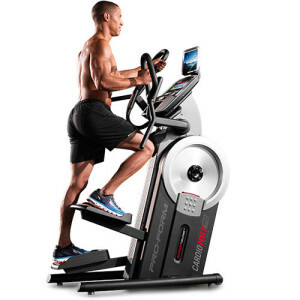 Like the TreadClimber, BowFlex claims through their research that the MAX Trainer will burn considerably more calories in comparison to a treadmill, stair-climber or elliptical trainer. However, they are comparing apples to oranges. What they don’t tell you is that the tests were done with the MAX Trainer set at some intense levels, while the other machines where at minimal levels of resistance and speed. Check out our Comparison Chart of all Bowflex machines here. Hybrid Stair-Climber and Elliptical Trainer — The MAX Trainer combines the best of a stair-climber and an elliptical. You get the intense cardio workout that comes from the stair-climber motion, plus the upper body workout that comes with the moving handlebars you would find on an elliptical trainer. So you are actually exercising BOTH your upper and lower body simultaneously, which is proven to get more results with less perceived level of exertion. The handlebars also have multiple grips so you can target different upper body muscles. Interval Training — The BowFlex MAX Trainer focuses on Interval training, where you go from intense exercising to periods of cool down. This is a technique used by professional athletes to optimize their performance. It does actually allow you to work out for shorter periods of time at MUCH higher intensities to get great results. The claim of only fourteen minutes a day is just a bit exaggerated. Easy to Mount and Dismount — In comparison to a rear drive elliptical trainer it’s very easy to get on and off the Bowflex MAX Trainer. Compact Design — If you have limited space for your equipment then the MAX Trainer is ideal. It has a length of 49”. In comparison to ellipticals and treadmills with lengths in excess of 70”. Pedals Angle — Unlike a stair-climber, the MAX Trainer pedals angle with the motion resulting in less heel lift and foot numbness. Easy to Assemble – Most customers talk about the ease to assemble, although it’s helpful to have two people for part of the assembly. Technology – The M6 and M8 use the Max Intelligence Platform. This is a new fitness intelligence platform that creates personalized workout programs based on your abilities and specifications. You performed an initial assessment and the machine creates programs for you. These programs will change and adapt as your fitness levels change. There is also a library of trainer-led videos and a fitness tracking and rewards program. Reverse Motion — Being more a stair-climber than an elliptical, you tend to have more of a reverse motion in comparison to an elliptical stride. An elliptical will result in less stress to your lower joints because the motion never reverses. Although the Bowflex MAX Trainer has considerably less impact in comparison than running or walking outdoors. Not a Heavy Weight Machine — The MAX Trainer weighs in at around 143 lbs. The combination of the moderate machine weight and the small base can compromise the stability for excessively overweight people or aggressive users. For comparison, the ProForm HIIT Trainer machines weight 180 lbs and offer a bit more stability with the same general motion. Noise Level — From the feedback of customers 273 said the machine was very quiet, that is in comparison to 46 who had noise issues. Technology – It is super important to note that this is a subscription service that is not included in the purchase price of the machine. A Max Intelligence system starts at $14.95 per month. It is also worth noting that you will need your own device to access the video content as the touchscreen is not a part of that upgrade. Should I Buy The Bowflex M3, M6, or M8? There is approximately $600 difference in pricing between the M3 and M6, and $600 more for the M8, so is it worth the extra money to splurge on the higher models? Heart Rate Monitor— Integrated contact grips on the M8 and M6, and just a chest strap include with the M3. Workout Programs — There are two programmed workout on the M3. If you are using the M6 or the M8, you won’t find any pre-programmed workouts as they now use the Max Intelligence Platform. This is a new fitness intelligence platform that creates personalized workout programs based on your abilities and specifications. You performed an initial assessment and the machine creates programs for you. These programs will change and adapt as your fitness levels change. There is also a library of trainer-led videos and a fitness tracking and rewards program. It is super important to note that this is a subscription service that is not included in the purchase price of the machine. A Max Intelligence system starts at $14.95 per month. It is also worth noting that you will need your own device to access the video content as the touchscreen is not a part of that upgrade. Other features: The M6 also comes with Bluetooth 4.0, a backlit display and premium grips. The M8 comes with an upgraded hand bar, media tray, display, pedals, and 2 additional user profiles. Conclusion: For an extra year of warranty, more in depth work out programs and Bluetooth compatible the M6 is probably the best choice for the extra money. While the M8 has some nice upgraded features, I would still choose the M6 as the best deal for the cost. Looking for an Additional Bowflex Max Trainer Upgrade? Bowflex now offers the Max Trainer M8 Performance Pack for an additional $300 on top of the M8 price. So what does the performance pack get you? The only additions are accessories, not upgrades to the machine itself. If you purchase the performance pack version of the M8 on the Bowflex website, you receive a heart rate monitor armband, a mat for the machine, and a Samsung Galaxy Tab E 9.6” tablet. The actual machine is exactly the same, so you’re mostly just paying to get the tablet, which you can get for under $300 on its own elsewhere. One of the biggest drawbacks to the BowFlex MAX Trainer is that there is nowhere you can actually test the machine. So you have to make a leap of faith. From my perspective it’s a decent cardio machine that gets results, but not the instant and easy results the infomercials and videos claim. The MAX Trainer does appear to have a high level of customer satisfaction, and that in itself is a strong endorsement. I did notice that most of the reviews were from people who were out of shape and overweight and wanted to get back into shape, and for that segment the BowFlex MAX Trainer has generally satisfied their needs in reaching their fitness goals. ProForm HIIT Trainer Pro – Read full review here. As mentioned, the main competition for these machines is going to be the ProForm HIIT Trainer and HIIT Trainer Pro. The main differences are that the HIIT machines are a bit heavier (hence more stable) and also offer the iFit Live fitness tracking programs (at an additional subscription cost). The motion on the HIIT machines is a little less circular. The most eye popping difference is that the HIIT Trainer Pro comes with a 10″ Color Touchscreen for web browsing, stats, and virtual workout courses. You would expect the price to be much higher with this huge benefit but the HIIT Trainer is only $999 and the HIIT Trainer Pro is only $1,499. These ProForm models stand up well to the Bowflex Max Trainers. See more comparisons between the machines in this article. To learn more, visit the Bowflex.com.